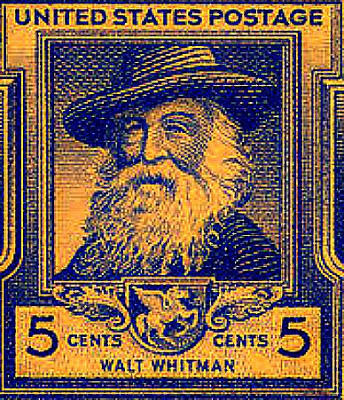 Walt Whitman says hello to all our FMO readers! FMO: How do you feel about having an image of yourself on a postage stamp? Walt Whitman: If you done it, it ain’t bragging. FMO: Many consider you one of America’s great poets and some call you the Father Of Free Verse. Your thoughts on this, sir? WW: To have great poets, there must be great audiences. FMO: Your bio indicates you were also a journalist, a teacher, a government clerk, and a volunteer nurse during the Civil War. You seem to have a real connection with the common folk. WW: I dance with the dancers and drink with the drinkers. FMO: You have obviously written a lot. Do you also like to spend time reading? WW: A morning-glory at my window satisfies me more than the metaphysics of books. FMO: Any thoughts on the current state of world affairs? WW: Judging from the main portions of the history of the world, so far, justice is always in jeopardy. FMO: What do you think the future holds? WW: The future is no more uncertain than the present. FMO: How do you deal with life on a daily basis? WW: To me, every hour of the day and night is an unspeakably perfect miracle. FMO: What lessons have you learned? WW: I have learned that to be with those I like is enough. FMO: What advice would you care to share with our readers? WW: Be curious, not judgmental. Keep your face always toward the sunshine and shadows will fall behind you. Note: Every response is an actual quotation from Walt Whitman.